Many groups are lauding the government’s Clean B.C. greenhouse gas reduction plan announced Wednesday but some advocates, academics and even the opposition are questioning how the province will meet its targets while also embracing liquefied natural gas. British Columbia's climate goals have an "LNG-sized gap" in them, according to one environmental group, which argues there can be no more gas export projects if the province is to meet its lofty environmental targets. 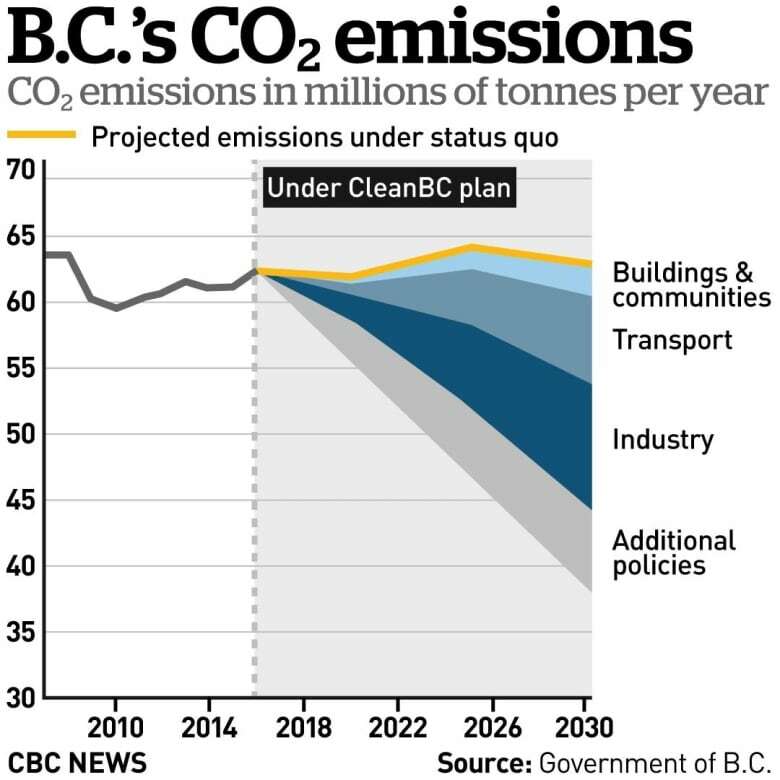 Many business and environmental groups and advocates are lauding the government's Clean B.C. greenhouse gas reduction plan announced Wednesday, but some, like Peter McCartney of Wilderness Committee, are raising concerns. "I still haven't heard an answer as to what their plan to make sure these [natural gas] proposals don't blow their targets out of the water completely," McCartney said. "There are all these proposals, and if they hit their targets, they can't move forward." The Clean B.C. plan includes, among other measures, rebates for home retrofits and zero-emission vehicles and incentives for the province's biggest industries to clean up their operations. It's part of the province's efforts to cut greenhouse gas emissions by 40 per cent by 2030, 60 per cent by 2040 and 80 per cent by 2050 from 2007 levels. The reductions outlined Wednesday however, only fulfil 75 per cent of the 2030 target. The province said the remaining 25 per cent will be worked out over the next 18 to 24 months. In October, the UN's Intergovernmental Panel on Climate Change issued a dire report that called for governments to reduce carbon emissions by 45 per cent by 2030 from 2010 levels. McCartney said B.C. 's targets, articulated in its new climate plan, are too modest to meet that goal and blames the province's pursuit of LNG projects. The provincial government, earlier this year, announced incentives to sweeten the deal for proponents of the LNG Canada proponents to build the $40-billion project in Kitimat. Premier John Horgan said the enticements would be part of the framework for approving future projects but McCartney said the already-approved LNG export facilities — LNG Canada and Woodfibre in Squamish — would take up almost all of B.C. 's allowable carbon footprint under the current targets. "It's a problem for them," McCartney said. "The fact that they've approved these facilities means not only do we have to work a lot harder but we may miss our 2050 targets." University of British Columbia climatology professor Simon Donner agreed during an interview with On The Coast host Gloria Macarenko. "When you take into account that we're trying to decrease... It's hard to see how LNG can be a part of that especially once we get past 2030," Donner said. "So that's the one piece of dissonance we're getting from the government." 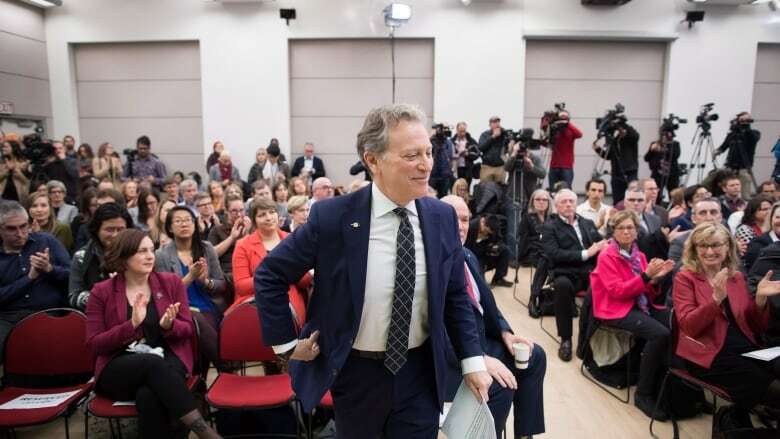 Climate change minister George Heyman said efforts to electrify industry — including the oil and gas sector — are a big part of the government's climate change approach. "We already are reaching agreements with people in the oil and gas sector as well as throughout industry to take measures to reduce emissions and electrify," Heyman said. He cited the example of a proposed major transmission line that will electrify the province's gas fields to replace the fossil fuels used for power. "Industry knows that the future is low carbon. They want a clear plan to get there." But B.C. Liberal climate change critic Peter Milobar said the government's inability to reach the 2030 goal with the measures announced Wednesday was a red flag. "The missing 25 per cent reduction of emissions, that's a big number to be missing," Milobar said. "How is that going to be accomplished? That's probably the contentious 25 per cent and the fact there's no detail on that should be concerning to a lot of people." This article has been updated to clarify comments by Peter McCartney about the impact of the liquefied natural gas industry on B.C. 's climate targets.